Small things speak volumes. Hang tags might be small but you shouldn't judge their ability to attract and inform consumers on your products. 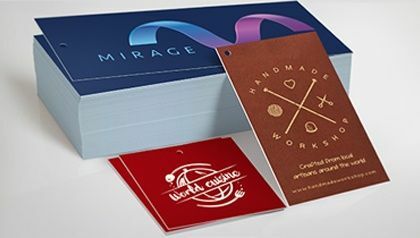 Whether you print hang tags as branding for clothing, jewelry, bottles, or virtually anything in retail, they have carved a niche as a unique way to showcase your brand story. Here at PrintRunner, we offer top quality hang tag printing for your branding needs. We have three types available for you, each with their own unique appearance and uses. The standard hang tag which can be rectangular or square shapes. These hang tags are perfect for writing additional text and branding design as well as more information about your products. 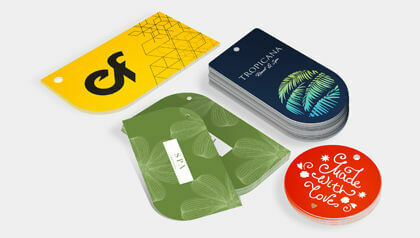 Die-cut hang tags can provide a creative approach to your branding. With several shapes to choose from—circle, half-circle, oval, leaf, and rounded corners—you can get more visual emphasis on your design and attract more potential customers. The folded hang tag which gives great use of space to convey information. You can even use the fold as a promotional gimmick like coupons or use it for social media marketing. Your imagination is your limit. Make your wine giveaways more personal with metallic bottle neck hang tags. The metallic print adds a luxurious feel and highlights your important message or brand. 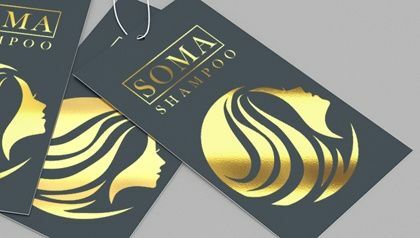 Foil hang tags offer a more luxurious experience for your target users. Use this for upscale branding and special events. Shiny, sparkly foil hang tags make the perfect tags for your holiday gifts and giveaways. The most effective hang tags are those that have a vibrant design. Choose the perfect shape to fit the shape of your own logo for maximum impact. Don't forget to relay relevant product information to your customers. We'll be glad to help you customize your hang tag printing with further options. 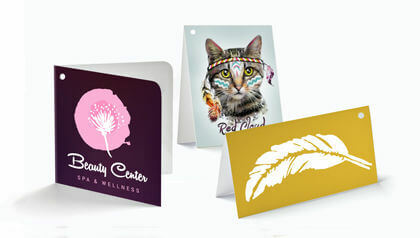 Choose from our top quality paper cardstock ranging from 13 pt. to 17 pt. Select the paper finish you want: uncoated, matte, gloss, or high gloss. Choose from 25 up to 10,000 hang tags in one order. We’ll print them in just 2 business days if you need them in a hurry.